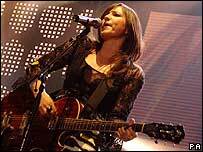 Singer KT Tunstall has said that her success in 2005 came as a massive relief after struggling to succeed in the music industry for over half a decade. The 30-year-old singer-songwriter took the music world by storm in the last 12 months, as debut album Eye To The Telescope sold more than a million copies worldwide. She told BBC World Service's Everywoman programme that she was relieved by her success, having always wanted a career in music. "I never had a backup plan for if it went wrong," she said. "Obviously that was dreadfully worrying for my parents for a good five or six years after university, when I was living in Scotland in a cottage with no money. "But thankfully, it led me on a path that has ended up here." Tunstall had an extraordinary year in 2005 - together with the likes of James Blunt and Daniel Powter, she was one of the singer-songwriters who shot to prominence in the last 12 months. Eye To The Telescope went gold in the UK after the release of just one single, The Other Side Of The World. Although the follow-up single Suddenly I See only reached Number 12, it became familiar to millions thanks to its use in a British Telecom advert. Tunstall said that one of her highlights of 2005 was playing at Glastonbury - "the total Holy Grail for any British musician." But she added that she was the only female lead singer on the stage that day, and was very disappointed in that. "I don't understand it - it seems so strange to me, still, that there's so few girls up on stage singing," she said. She admitted that she had been very nervous before her Glastonbury performance - but has been performing since eight and "always loved it". "You recognise that actually, being nervous can add that extra level of pizzazz to your performance," she added. "When I'm on stage it's the closest I ever get to meditating. I can never shut down and stop - when I'm singing it's just very in the moment, and just doing what I'm doing and not worrying about anything else." Tunstall explained that influences as varied as punk legend Patti Smith and Scotland's rough seascapes lay behind her outstandingly successful year. 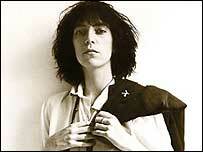 In particular, she aspired to the famous image of Patti Smith on her album Horses. "I aspired to what this image was about - which was a woman dressed in man's clothes with such mystery, but such confidence and attitude and character," she said. "I just thought, 'that's so what I want to be when I grow up'." Meanwhile Tunstall also explained that her latest single, Under The Weather, was an answer to the terrorist attacks in the US on 11 September 2001. "It was in the aftermath of it all - which was a global feeling, obviously not contained just within America - that everybody really harked back to just needing to be with the people they loved, and wanted to know that the people they loved were safe," she said. "They wanted to spend time with them. Things like this always put life into perspective, and you realise that actually, this person that you've been arguing with is really that important. "It's really just about people needing each other." She also explained how, more generally, she had been strongly influenced by her home of St Andrews, on the east coast of Scotland, without realising it. "Ask me a year ago and I might have said it doesn't really matter where I'm from," she said. "But since I've been away from it, it's dawned on me that if you read through my lyrics the sea is in almost every song. Landscapes always provide an important lyric tool. "I miss it dreadfully - the sea, the countryside, the space. I always tend to use it when I'm writing, so yes, it's very important... once you leave, you're more Scottish than when you lived there."